Design, supply and installation of equipment, including 4 automated continuities and a control room. Ability to work also in HD. 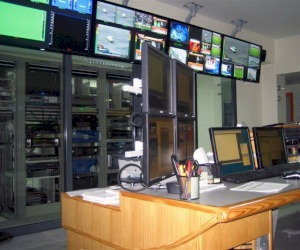 The entire baseband a/v system is based on EVERTZ, (128×128 HD-SDI router,4X HD / SD master control switchers, various interfaces and multiviewers). OnAir Graphics Systems are provided by WASP3D and Visual Research Inc. Automation and servers are provided by VSN. VSN system includes 4 ingest servers, 4 Transmission servers and ability of 10 journalists and 3 editors (Apple & Avid) to preview and edit material on line.